Okay, so I cribbed the title from Proust. It isn’t plagiarism, it’s research. Most of the time, going back to places you visited as a kid is disappointing. What you recall as shining and glamorous is dingy, cheap and old. Lacking the wonderment of youth, the glories of the past are too often sadly tawdry. Yesterday, none of that was true, and I can’t wait to tell you about it. We went to Sunday lunch at the Cliff House in the City. The first time I saw the Cliff House was when my father brought us up here from Los Angeles house hunting in 1961–it was still the remnants of the Sutro Baths, and a famous city landmark, along with the camera obscura and Playland at the Beach just down the road. Like any kid, I was amazed and fascinated. Since then, the building burned down, the camera obscura was demolished and Playland at the Beach and Laughing Sal have been replaced by condos. Time inexorably marches on, and landmarks become just memories. 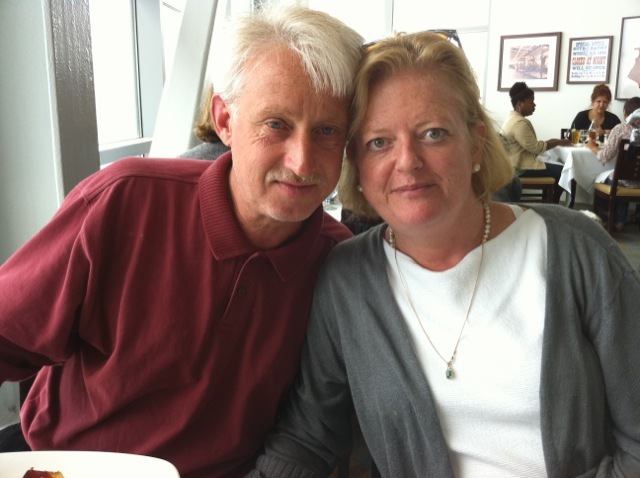 We went to lunch with Gail’s eldest daughter, Kate, and her sweetie, Brad. We’ve reached the age where children become good friends, and we enjoy spending time with them as people more than as progeny. You have a couple of choices here; there is a large Sunday Brunch Buffet, or an order-off-the-menu restaurant. We chose the restaurant, partly for the food and mostly for the view–the buffet room, for some inexplicable reason, is heavily curtained, blocking the stupendous views. The room in which we ate was all glass, as you would expect. Hanging over the Pacific Ocean, designed and decorated in a warm yet very modern style with a view seemingly all the way to Tokyo, it was just perfect. To start with, I had a house specialty Ramos Fizz–which was incredibly delicious, and I got quite a buzz out of it. You can’t taste the liquor in a drink like that, and I’m a major lightweight when it comes to hard liquor. At least I’m a lightweight somewhere….. The food was as good as the room. I started with Ahi Tartare, a timbale of diced sushi-grade Ahi Tuna, mixed tableside with quail egg, onion, Asian pear, pine nuts and jalapeños. My entree was the lamb loin sandwich, thick slabs of rare lamb served on a roll with tapenade, wilted spinach and grilled onion. I enjoyed them both. 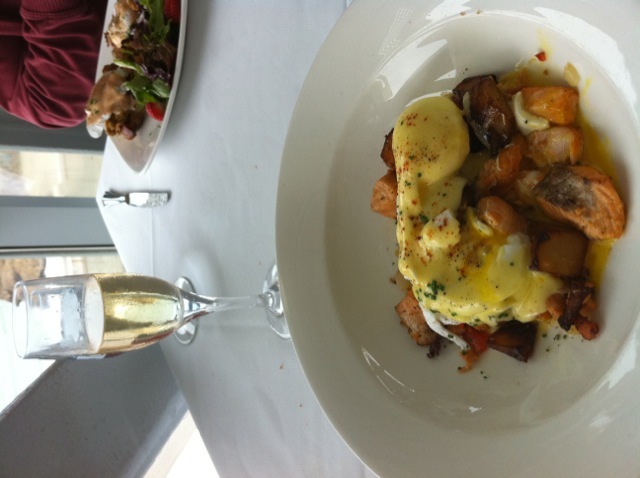 Gail had the Salmon Hash, topped with poached eggs and hollandaise. The presentation was beautiful and the dish excellent. Sweetie Brad enjoyed the Fried Oyster sandwich, and Kate savored the Fritatta. There were only good words about any of the dishes, including the Crab Cakes we had as an appetizer. The Cliff House isn’t cheap, it deserves the $$$ in the listing on Opentable.com. But it’s like the MasterCard commercial: going back to the places of your youth and finding them even better: Priceless.